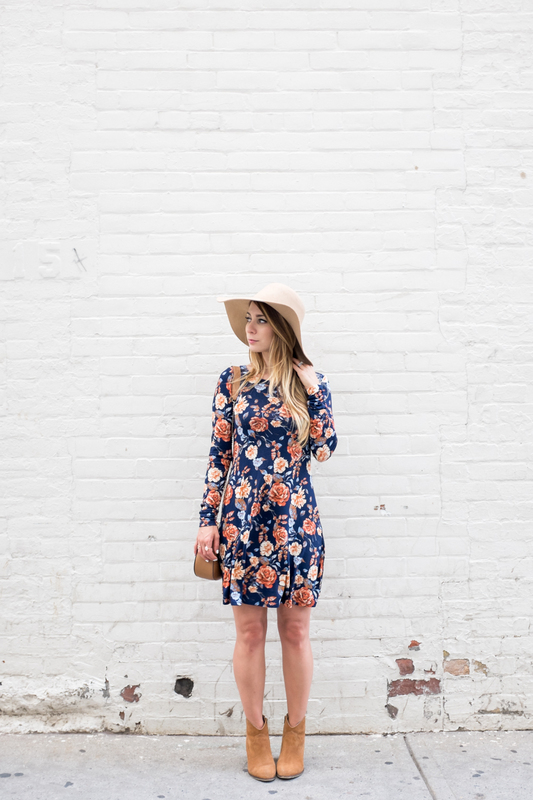 OOTD - Navy Floral Dress | La Petite Noob | A Toronto-Based Fashion and Lifestyle Blog. Deny it as we may, fall seems to be just around the corner. Although the weather in Toronto still feels like summer, the nights are getting longer and we're well enough into August to start thinking about transitioning your wardrobe from summer to autumn. This navy floral dress is the perfect transitional piece as it's still lightweight enough to wear in the heat but the colours make it fall appropriate. 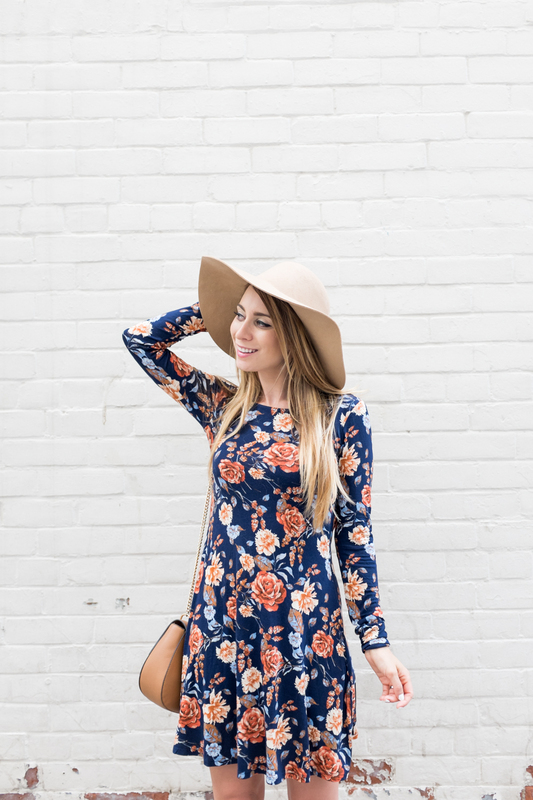 I can totally see wearing this same dress with a pair of opaque tights once the cooler weather rolls in, but in the meantime I'm perfectly content to rock it with a pair of camel booties and my favourite floppy hat. I still can't believe how much wear that I've gotten out of this Chloé-inspired, inexpensive purse. Not only has it saved me from shelling out the two thousand plus dollars it would take to get the real thing (which, might I add, I totally have no business doing), but I've been appreciating how low-maintenance vegan leather is. Chance of showers? Who cares! The first few drops of rain would normally have me sprinting for shelter to save ruining my typical leather bag, but now I'm cool as a clam. Now if I could only find the same weather-proof solution for my hair. Are you starting to prep your wardrobe from summer to fall, or do you think that it's too early to think about that yet? Let me know! Slowly I have been finding myself relying on more neutral, transitional pieces. This usually happens to me around the end of August! Summer- where did you go?! I totally agree Gabriella, this summer has totally flown by! Great look! Love the dress and hat! Soooo not ready for summer to be over, but I can see those September issues right around the corner and they have me thinking fall wardrobe! Kris | Love. Loft. Life. I absolutely love your dress, it's perfect for fall. I actually have a similar one which is also from forever21. I'm always waiting until september to get into my fall wardrobe ^^ I think it's associated with the whole back to school thing. Our school started mid september and that was my "official" end of summer. So true - I haven't been a student in years, but as we approach September I'm always right back into that 'back to school' mode! Love the dress! I don't think too much about my autumn wardrobe yet but I guess buying the right boots are important and should be done quick. Thanks Natacha! It's so true about getting the right boots quick - I always start early now because it seems like all the cute boots are sold out by October! 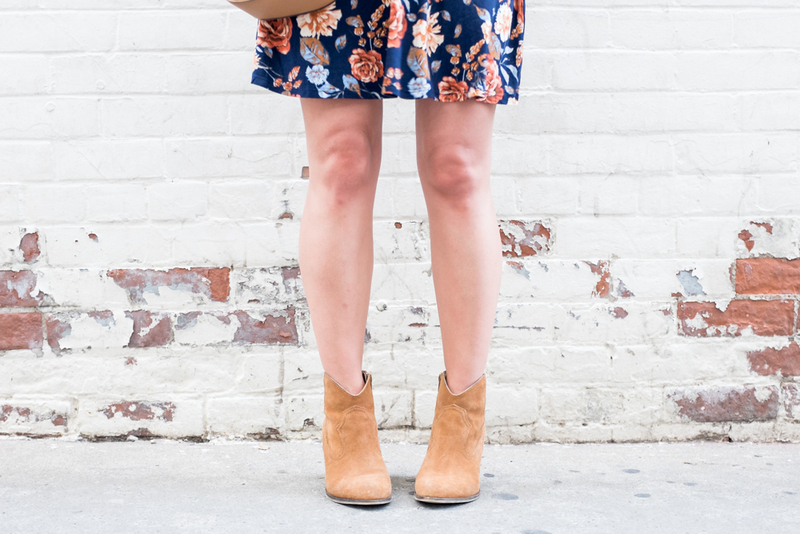 It's still too hot to be thinking about fall here in Texas but this dress is so cute! The colors are great! Thank you Cymone! I envy your Texas weather - although it's still hot here in Toronto, I know that it can be freezing at a moment's notice! Ohhh I LOVE this dress and the pretty floral! So cute with the boots! Thanks so much Justine, I love it too! 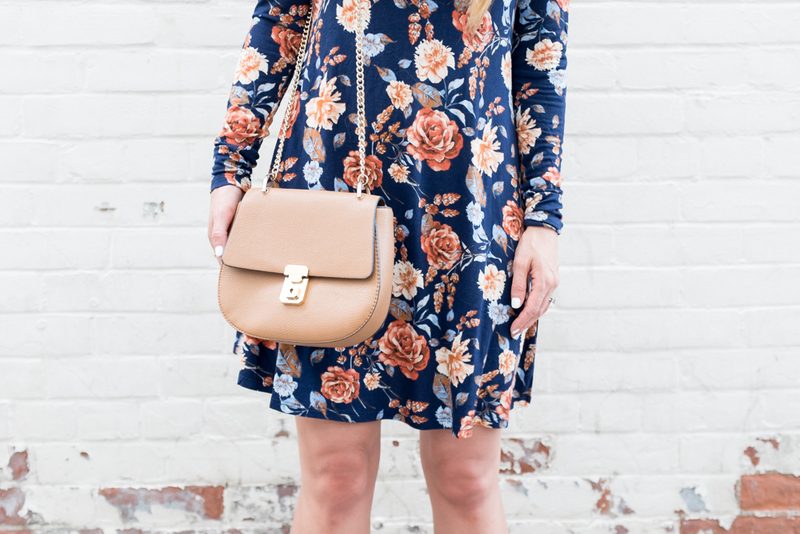 I wish I could have an entire closet full of floral dresses! Amazing look! Your hat compliments this pretty dress perfectly!